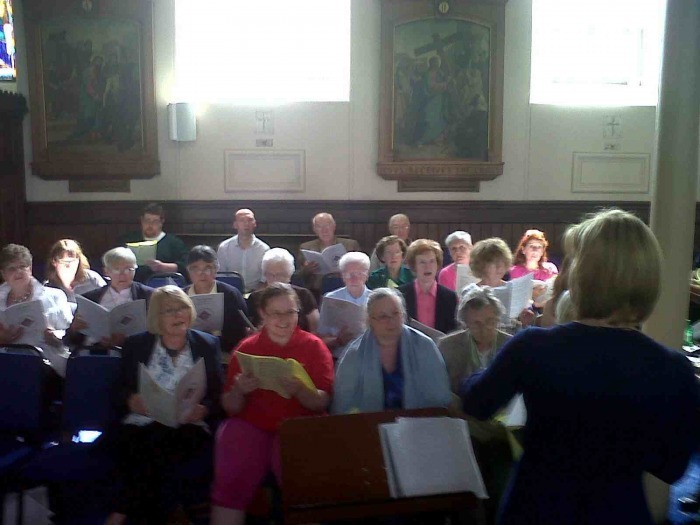 Although the choir had a short recess during the month of July, preparations for the Papal Mass were in full swing and throughout the summer we were hosting and attending deanery rehearsals in conjunction with our colleagues at St Mary’s Pro-Cathedral, where much of the workshops have taken place. Above: Rehearsal on Sunday 1st August at St Mary’s Pro-Cathedral with choirs from St Andrew’s, St Paul’s Shettleston, St Joachim’s Carmyle, St Joseph’s Tollcross, and Lady of Good Counsel, Dennistoun. Left, the altos and sopranos getting to grips with the complexities of Anton Bruckner’s beautiful ‘Locus Iste’! Right, focus on the altos and tenors. Listed below is some of the music we’ll be practising over the next few weeks. 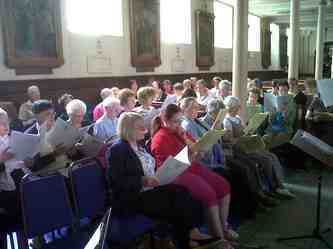 Plus the descants, SATB parts to the many hymns and mass parts to be used at Bellahouston. For further information on the full programme or to listen to mp3s of the Macmillan mass parts, go to www.forthinpraise.co.uk or contact Rob or Maria at music@cathedralG1.org to find out more about rehearsal times, venues etc.